Following our wonderful gourmet dinner at the wine expo on Makarska, we were invited to visit chef Braco Sanjin at his usual kitchen in the lovely Restoran Kadena in Split. We’d spent the morning trailing around various home-improvement superstores in pursuit of equipment for our new BBQ, and were somewhat disillusioned with the cabilities of our GPS system by the time we finally rolled up at Kadena for a slightly late lunch! 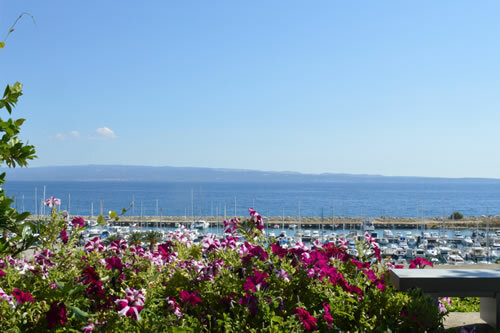 The restaurant overlooks the pretty marina at Zenta, and we settled into our reserved table with a lovely view out to the island of Brač. 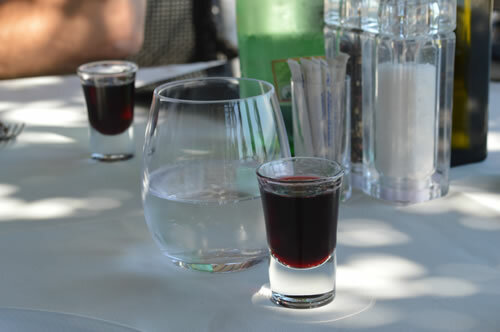 Starting to feel better already, we chatted to Braco, and had a glass of Borovnica (blueberry) as an aperitif. He asked how much time we had, and we mentioned catching the 5:00pm ferry back to Hvar, though I joked there was always another at 8:30! The sommelier arrived to discuss the appropriate wine to go with our starter. We went with a Marijan Bogdanjuša, a lovely light, floral white from one of Hvar’s outstanding winemakers. It went extremely well with our trio of starters and we were delighted to see one of the smaller wine producers from the island represented on the wine list here. 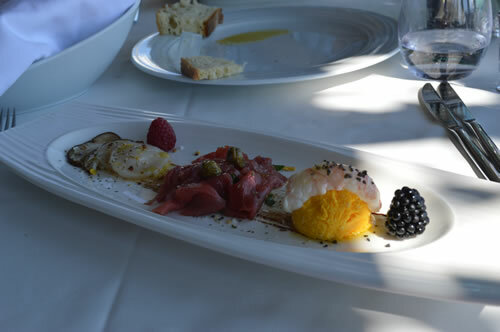 The trio of starters was a porcini mushroom served with coquille st jacques; carpaccio of tuna on a bed of arugula, wasabi, lemon honey and soy; and a shrimp marinated in vanilla and orange, served on fresh goat’s cheese with truffles in a honey lemon drizzle. A lovely delicate combination of flavours. 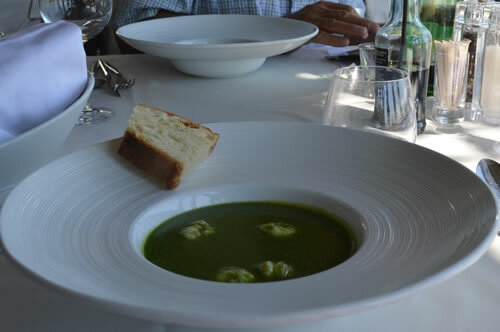 Next came soup of broccoli and scampi, served in a dish that would make a very elegant hat. If it wasn’t ceramic, that is! The soup was extremely tasty, so was the fresh bread selection and we sent the dishes back well polished. 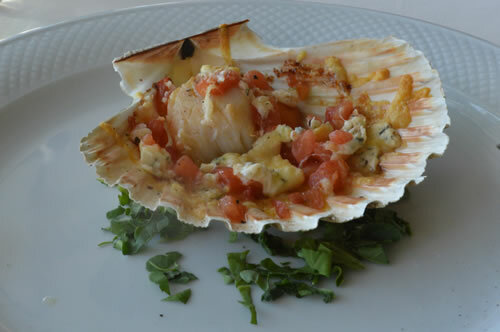 The fish course was a Coquille st Jacque au Gratin, served in the shell with diced tomato and cheese, on a bed of watercress. Again, the taste combinations were superb! It was time to select another wine. We approved the sommelier’s suggestion of the excellent Pošip Intrada from Krajančić on the island of Korčula. If I give the impression that the courses were arriving thick and fast, let me correct that here. This was one of life’s more leisurely lunches in a beautiful, peaceful setting. It was about to take us all afternoon. Plenty of time to chat and between courses we sipped the wine and enjoyed the view. 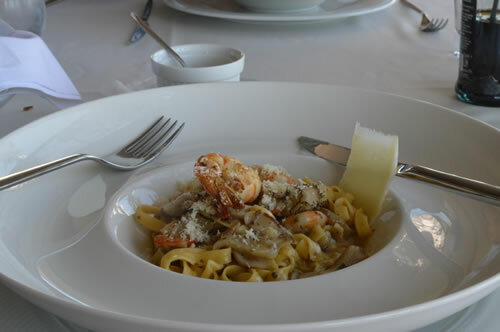 The pasta course was Tagliatelle with porcini, truffles and tiger prawns. This was in early September, and I love it when truffles start to appear on the menu. So the generous shavings of truffle were a real delight in this dish! As I’ve probably mentioned before, I’m a vegetarian who eats seafood, so you won’t see any meat appearing in this particular gourmet lunch. But there was wonderfully tasty seafood. 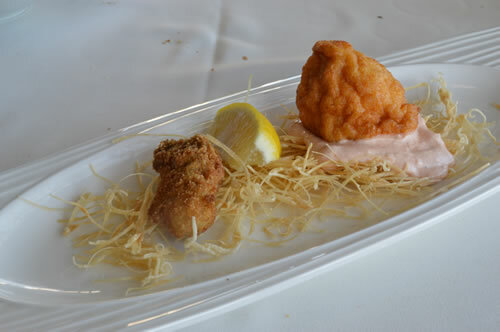 Our next course was deep fried oyster and a souffle of calamari on cream of prawns. The bed of “crispy noodles” was actually a play on the traditional Dalmation pastry which usually comes in thin strips, though not normally this delicate! Sommelier Damir Slavković’s choice of wine with this course was a Bire Grk, as it’s slightly more acidic to balance the fried food. By now, we were getting to know him quite well, and again, his selections were spot on. We had visited two different islands during our meal (Hvar and Korčula) and each wine was perfectly matched with the food. 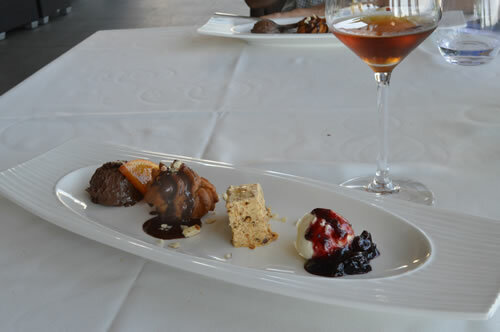 We were now about to circle back to Hvar again with a glass of Tomić’s Hektorovich prošek to go with our dessert. How wonderful! By now my joke about the later ferry was turning into reality. Our dessert arrived, and there was no need to rush, was there? From left to right we have a mousse au chocolat with a slice of orange; profiterole with hazelnut semifreddo; and gelato with a cherry compote. And a generous pouring of our favourite prošek. What a perfect way to round off a wonderful gourmet lunch, created by one of Croatia’s very best chefs! Thank you, Braco, and thank you to your team! 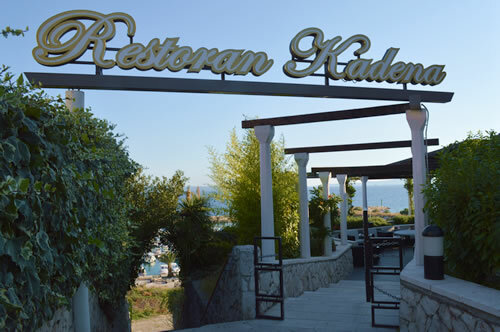 In related news, I notice that Kadena is the restaurant of choice for Croatia’s President Josipović when he’s in the area – excellent choice, sir!